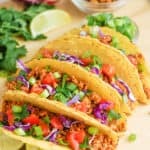 This delicious vegan tempeh tacos is an easy and healthy recipe that will spice up your next Mexican taco night! I’ll show you how to cook the best tempeh tacos that both meat eaters and vegans will love! Top with avocado, rice, black beans, and salsa! Add diced red onion and let saute for about 3 minutes or until slightly translucent. Add in tempeh and cook for 5 minutes, stirring occasionally. Add spices and 1/3 cup water to saute pan with tempeh and stir till evenly coated. Let heat through and simmer for about 10-12 minutes or until most water has evaporated. Store taco meat in fridge for up to 5 days.